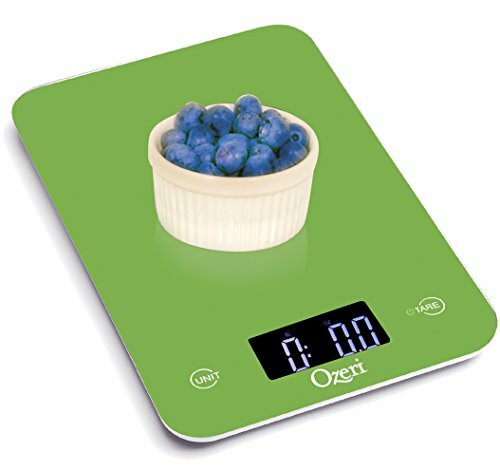 A coffee scale is a must-have for the home of a coffee geek or restaurant coffee brewing setup. It takes a precise brewing process to make a perfect cup of coffee every time. You have to know exactly how much coffee ground is going into each batch to make it as strong or mild as you want. A digital coffee scale will help you to use the right amount of coffee ground, down to the gram! It will also ensure you’re pouring just enough water into the reservoir to brew that perfect cup of coffee. If you’re looking for a good coffee scale, you’re in luck: we’ve done the research to bring you only the very best. We’ve combed through hundreds of products and read over thousands of reviews to ensure we find the coffee scales that pair quality, durability, and functionality with a reasonable price tag. Why We Love This for Coffee? This kitchen scale is simple and easy to use for measuring just the right amount of coffee. It measures in increments of 1 gram (or 0.05 ounces), and it can handle up to 11 pounds (5050 grams). The beautifully large weighing platform will give you more than enough space to measure any amount of coffee—ground or even fresh beans! One of the great things about this gram scale is that you can calculate the “net weight.” You can set it to automatically deduct the weight of the container to ONLY measure the ingredients (coffee ground). The Automatic Unit button will convert the weight between grams and ounces, pounds and kilograms. The results are displayed on the LCD screen, which is powered by 2 AAA batteries. The audible beep will let you know when the scale has calculated the weight correctly. At $11, this is a very well-priced scale! It delivers quality, versatility, and a user-friendly design. Definitely the best for measuring out just the right amount of coffee. Check out the latest discounts and prices! Can we all agree that the perfect cup takes perfect percision? 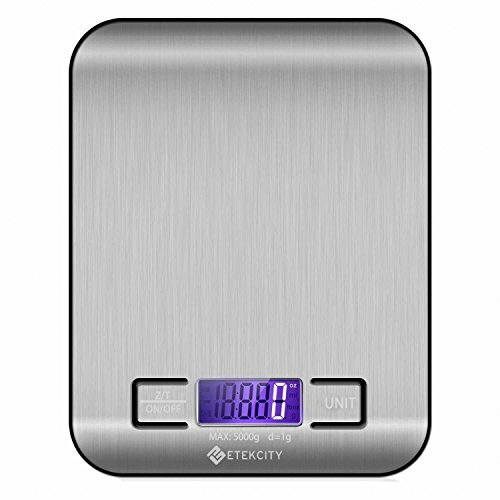 Well, with this state-of-the-art digital scale, you can easily read the LCD display and get that perfectly perfect measurement, every single time. The stainless steel looks great in most modern kitchens and you’ll feel good having it sit on your countertop. 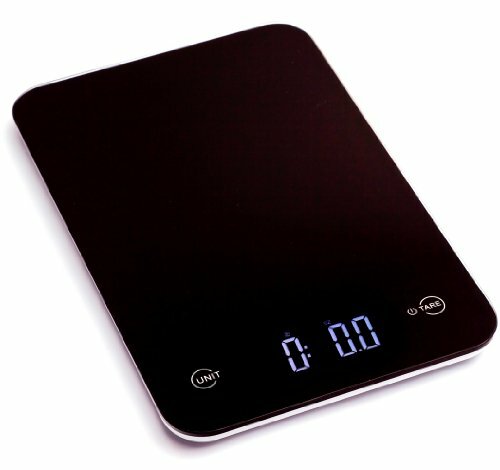 This is a sleek, good-looking digital kitchen scale. The brushed stainless steel exterior gives it a modern appearance that will sit beautifully in any contemporary kitchen or chic coffee shop. With increments of 1 gram or 0.05 ounces, it will deliver precise measurements of your coffee ground or beans. The 4 high-precision sensors built into the weight plate will give you highly accurate readings. The TARE function allows you to quickly reset the scale to zero, and you get the unit conversion at the press of a button. The LCD screen will display when the 2 AAA batteries need changing. Thanks to its compact design, you have a beautiful scale that takes up very little counter space. Again, we love this stainless steel scale with easy to read LCD display, which gives very clear, precision readings that you’ll need when weighing coffee. There is also a decent Tare Function, which allows you to automatically deduct the weight of your container so you don’t have to do quick math. The small size also means you can tuck it into a corner in your kitchen, throw it into a drawer, and just pull it out when you need to brew that perfect cup of Joe. Considering that you’ll pay less than $11 for this scale, it’s definitely an option to consider. It’s definitely a sleeker, more elegant option than our top-rated pick, though it doesn’t deliver quite as many functions. Still, worth every penny! Check out the latest prices and discounts here! This scale can hold up to 12 pounds (more weight than the others on the list), making it a great option for those who want to measure coffee along with meat, flour, and heavier ingredients. 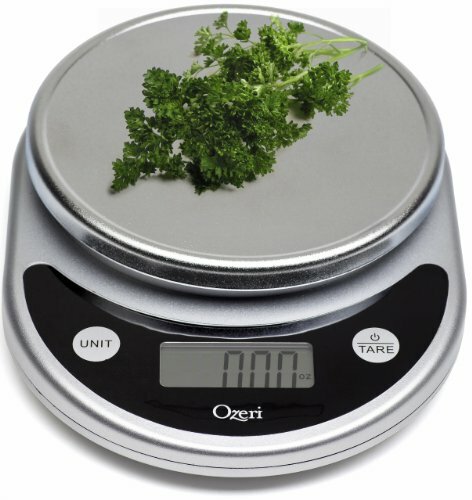 The high-precision GFX sensors built into the scale deliver better accuracy in your measurements, which range from 1 gram (0.05 ounces) to 5750 grams (12 pounds). The tempered glass surface is beautiful and sleek, giving the scale a modern look that matches any minimalist or contemporary décor. The glass can handle a lot of heat and weight—it’s up to 4 times more durable than regular glass. The TARE setting will deduct the weight of the container to ensure a highly accurate reading of JUST the contents. With the 2 included lithium batteries, you get excellent battery life from this scale. The numbers are large and easy to read, even for those with vision impairments. As long as you don’t measure large plates (which cover the screen), you will have no trouble reading the measurements. At just under $15, this is the priciest scale on our list. It’s a bit more expensive than the other options, but no less a high-quality choice. If you like the look of tempered steel, it will make for a beautiful kitchen appliance. Check out the latest discounts and prices here! Unlike the other two options we’ve given you on this list, this is not a stainless steel scale. Made of tempered glass, this perhaps has the most modern, sleek look of all of our choices. The LCD screen readout is clear, precise, which you’ll need to get the right amount of grinds or beans. It’s also available in a wide variety of colors, so you can pick and choose one that suits your kitchen decor, or just do like I did and pick the brightest lime green just because you love it! If you’re looking for a quality kitchen scale, these options above are the ones we highly recommend. They deliver quality and reliability at a very reasonable price. 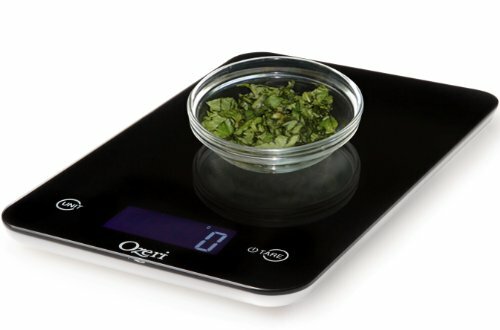 You’re paying $10 to $15 for a scale that will give you accurate measurements down to a single gram (0.05 ounces). Talk about total control over your coffee!